As on any trail, you'll need to protect your food from animals during the night. 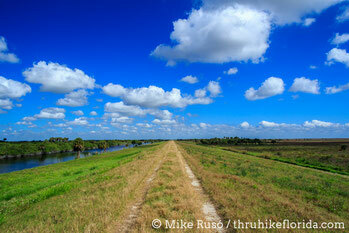 This is trickier than you might expect on the Florida Trail. If raccoons and rodents were the only issue, you could simply sleep with your food. However, Florida is home to a subspecies of black bear and so food must be secured outside of camp to prevent incidents with bears. Unlike some parks out west, there is no legal requirement to use bear canisters anywhere in Florida. Four common trees along the Florida Trail are terrible for bear bagging: cypress, pine, scrub oak, and palms. 1) Cypress branches do not grow far enough from the trunk. 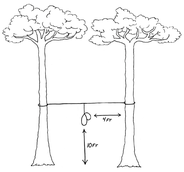 2) Pines are usually very tall with no branches low enough to throw a line over. Even if there are branches low enough, the soft pine bends easily and the weight of a bear bag can pull a branch almost to the ground. 3) Scrub oaks are usually too short. 4) Palms have all the problems mentioned above. Keeping food outside of camp overnight leaves it exposed to potentially heavy rains. Even when food is kept in Ziploc bags, rainwater finds a way to get to it and turn it into a soggy mess. Roll-top dry bags work well to keep food dry when it rains. Live oaks are the ideal Florida bear bag tree. They grow tall, have branches that extend far from the trunk, and their wood is strong. In this best-case scenario, throw your line over a branch at a point at least 10ft from the trunk. 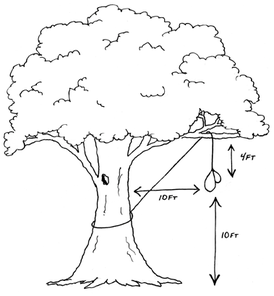 Next, hoist your bags up so that they are at least 10ft off the ground and 4ft from the branch, then anchor the line to either the trunk or another tree. Anchoring the line to the tree trunk or another tree is okay. No need to counter-balance bags. Unlike Yosemite bears, Florida bears have not figured out that if they swipe the rope food will fall from the sky. What do you do if you are in long leaf pine forest and there are no oaks around? 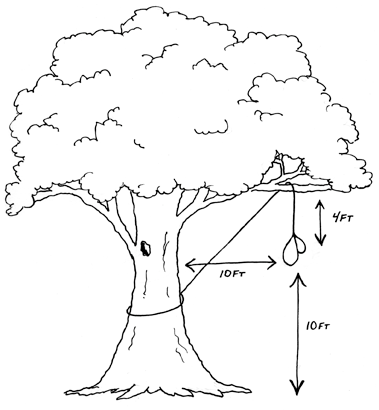 The Florida State Forest Service actually created a brochure about bear bagging that contained an illustration like this one to the right. It looks great at first, until you try to figure out how to do it. Pines do not have low-lying branches or even stumps of branches, their bark is smooth and flaky, and their trucks are straight. Unless you are 14ft tall, this drawing is impossible. 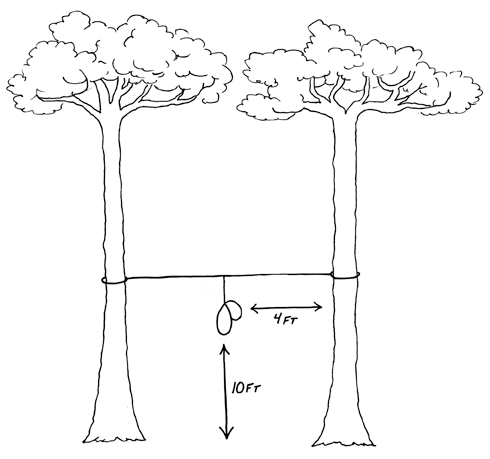 The solution is to find shorter pines and use the two-tree hauling technique. This requires a lot more line. We recommend bringing 50ft. 1) Tie your line to a stump, log, or small tree. Regular fires in pine flatwoods leave forest floors empty, so this can be harder than expected. 2) Throw the other end of the line over a branch. 3) Attach your food bags to the line with a carabiner, so that the carabiner can slide freely along the line. 4) Throw the loose end of the line over a branch on a second tree. 5) Pull hard on the line until the food bags have risen at least ten feet, then tie it to another log or stump. 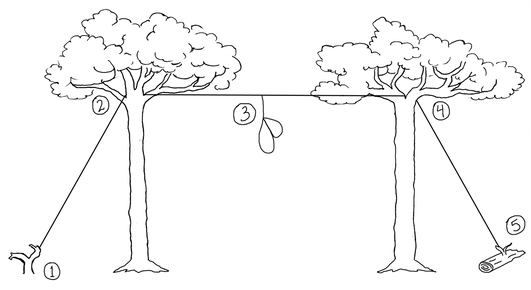 Ideally, the bags will slide to the midpoint between the two trees, but most likely your two branches will not be at the exact same height and so the bags will rest closer to one tree. That's okay as long as the bags remain at least 4ft from the branches. The two-tree haul technique will work for you most of the time where environmental conditions do not allow large oaks: the Big Cypress Swamp, long leaf pine forests, and the scrub. However, during levy walks through the Everglades Agricultural Area and around Lake Okeechobee, there are no trees whatsoever. All around you is wide open farmland, sugarcane, or marsh. The best shade you can hope for is a single palm. During this stretch it is okay to sleep with your food. There are no bears on the levies. To get your line over a branch, it needs to be tied to something heavy you can throw. Typical advice says to wrap the line around a rock. Sounds fine, except there aren't any rocks in Florida. Really. The peninsula's bedrock is soft limestone, which doesn't break off into chunks like harder rocks. You won't find a single rock on the ground. Besides, getting a rock to stay tied to your line is so notoriously hard, outfitters sell "throwing rock pouches" so you can stuff a rock into a sack, but that's a waste of money and adds needless extra weight. We've even seen people suggest putting a rock in a sock, which would just ruin your socks. This hilarious video from Backpacker Magazine shows everything that goes wrong when bear bagging. Instead, tie your line around the neck of your water bottle. It's easy to get on and off. Bottles are indestructible, and when partially full can be thrown much farther than a rock.